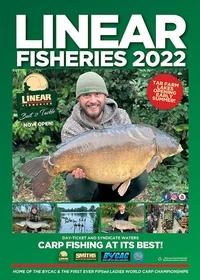 It is Linear’s policy to be fair and honest with the visitors to their waters and for this reason we have no silly rules. Very few visitors are banned from the waters or told to leave but the bailiffs will send anglers away if they blatantly disregard the rules that we do have. For instance anglers have been told to leave after parking their vehicles on the grass having driven past notices saying they should not do so, unloading their tackle in unauthorised places where there could be a danger to themselves or others, lighting fires on the bank, being abusive and spoiling the fishing for others, leaving their rods unattended and leaving litter. Linear is now operating a zero tolerance policy to any acts of aggression or abuse towards its bailiffs and staff. Cars must be parked in the car parks provided. Do not block or park in front of any fishery gates, if you block a gate, you may be asked to leave the fishery. 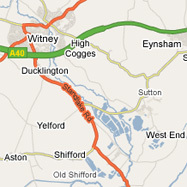 Anglers must not stop their cars anywhere on the main B4449 road or in the entrance to Manor Farm Lake & St. Johns. Anglers fishing Hardwick Lake & Smiths Pool should only leave their vehicles in the main Hardwick car park although they are permitted to unload their tackle along the track leading to Brasenose and adjacent to the two waters. No driving or parking on the grass at any of the lakes. If you break this rule you will be asked to leave the fishery, no matter how far you have travelled. You are not allowed to reserve swims – The only exceptions are as follows: A) If you have already spoken to one the fishery bailiff's and paid for the swims when setting up. B) You are allowed to put a bucket in the swim when you first arrive and choose a swim but you must immediately return to your car, load your tackle and return to that swim. If a bucket is left in a swim for longer than 45 minutes, fishery staff may remove it. C) Lake hire is available for match and events, waters can be booked in advance dependant on availability, only bookings of over ten will be considered. Barbed or barbless hooks may be used. Please Note: Hunts Corner Pond Rules may vary to the main day ticket carp lakes – See noticed board located at Hunts Pond. Rods must not be left unattended. Up to three rods only are allowed and you must have the appropriate E.A. licence to cover these. 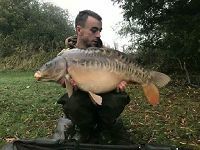 No carp, pike, catfish or any other fish to be retained for long periods - carp-sacks are not allowed. Floating retention slings are permitted for retaining fish for up to 30 minutes whilst un-hooking mats, scales and cameras are prepared. (Please see further details on retention slings under the Rules Header of our web-site). Unhooking mats must be used at all times for all carp, pike, catfish and large fish of other species. NO DOGS EXCEPT ON A LEAD AND UNDER CONTROL. There are no bait restrictions, but all multiple baits such as seeds, nuts, peas and beans must be well soaked, well cooked and used in moderation. Permanently fixed leads are not allowed and unhooking mats should always be used for any fish - RIGS WILL BE CHECKED BY OUR BAILIFFS. You are not allowed to use a spomb to introduce bait unless it is used in conjunction with a 'spomb float' attachment (if you’ve haven't got one with you, they can be purchased from the fishery). This is to help prevent lost/cracked off spombs sinking to the lake bed and causing snags. Spodding maggots is no longer allowed. They can only be used as hook baits, in PVA bags or in feeders. As a general rule you shouldn't be using more than around 4 pints per day. No live or dead baiting is allowed for catfish or pike between March 31st and October 1st. No live fish to be taken onto the site from outside sources. No transferring of fish between waters - no fish to be taken away or killed. Pike fishing is only allowed in the winter months between October 1st and March 31st. Wading is not allowed, except when aiding in safe netting or release of fish, in shallow water areas. Please do not wade on any of our waters to position baits. Always put your own safety first when returning fish. The lakes are on private property, so you should do nothing to disturb others, make no noise and keep lights at night to a minimum. If you are fishing the back of Smiths Pool you MUST NOT cross the ditch from Brasenose-One to unload your tackle, these slopes are slippery and dangerous and must not be used. 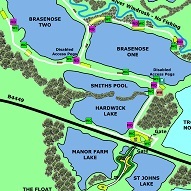 All tackle must be unloaded at the end of Smiths Pool and walked along that bank to your swim. The use of BBQ’s is permitted but they must be raised off the ground. If you use a disposable BBQ and it burns the grass you will be asked to leave the fishery. Anglers fishing Oxlease Lake must wait in the main Hardwick car park until the gates to this lake are opened – Do Not block the Oxlease gate and park along the track adjacent to Newlands Angling Club or you will be asked to leave. If you double up in a swim you can only fish two rods each, with the exception of a handful of large swims dotted around the complex. If you are unsure whether you can use 2 or 3 rods each, when doubling up, please check with the bailiff. Beach-caster rigs are allowed but they must not be fished near heavy weed and you must be watching your rod at all times to avoid your hook bait being picked up by a bird. Only one beach-caster set-up can be used at a time. Most importantly the lead and float must be designed so that they can drop off or break away from the hook-link, if the setup is lost. Day tickets are available from the Linear Bailiffs who patrol the waters regularly. 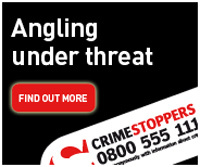 You may start fishing at your chosen lake when you arrive and pay the bailiffs when they come around. just turn up and pay the bailiffs on the bank. We do not take bookings on general day tickets, the only bookings we take are for matches/events, booking the disabled swims, bookings of over ten people, for some filming/PR requirements and for some tutorials . There is usually room on our day ticket waters, even at the busiest of times. The highest possible standard of behaviour will be expected from everyone who visits the site. 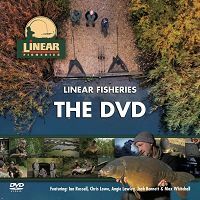 Linear Fisheries [Oxford] Ltd excludes liability for loss or damage to vehicles or property caused by circumstances outside our reasonable control or that of our agents or employees. Except in the case of death or personal injury caused by negligence, our liability under or in connection with this agreement, whether arising in contract, tort, negligence, breach of statutory duty or otherwise, shall not exceed the sum of £15,000,000. Neither party shall be liable to the other party in contract, tort, negligence, breach of statutory duty or otherwise for any loss, damage, costs or expenses of any nature whatsoever incurred or suffered by the other party of any indirect or consequential nature including without limitation any economic loss, profits, business or goodwill.